Hi everybody! 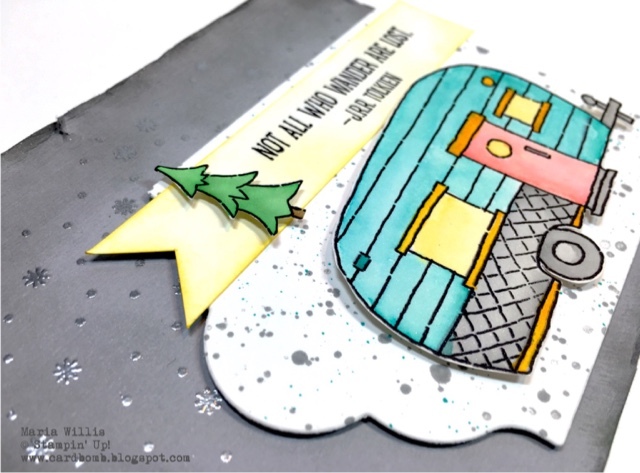 It's Monday and I'm back to share another fun What Will You Stamp Challenge with you. This week we have been challenged to use this adorable set from the holiday catalog... Glamour Greetings! 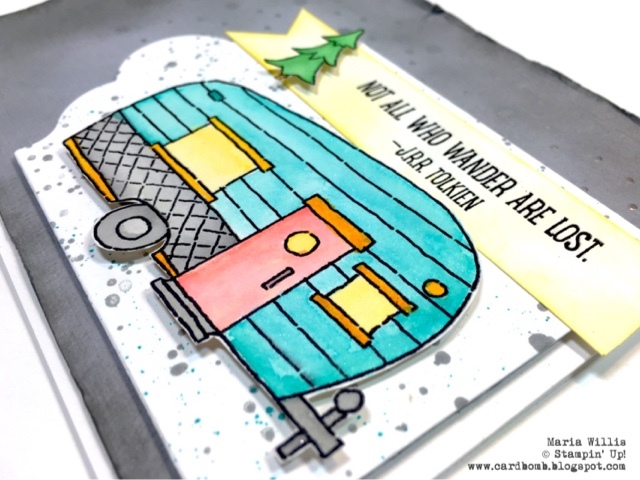 I really had fun watercoloring the camper and in case you didn't know you can stamp the camper in different ways. I chose to add the crosshatching to the bottom of the camper and stripes to the top but you can leave it plain if you like. 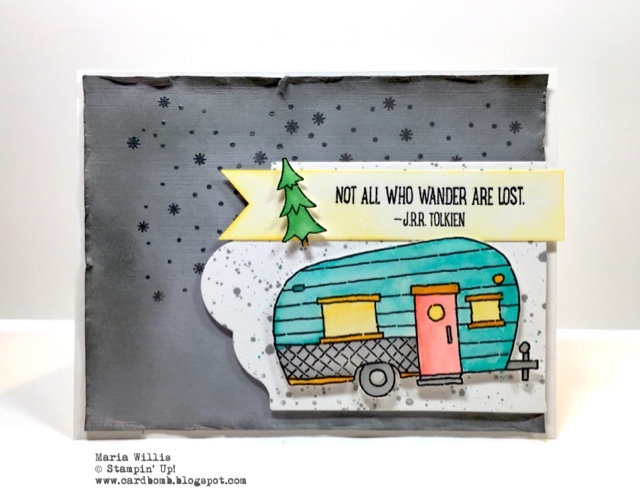 I chose bright colors for my camper and used my favorite sentiment from the set. Here's a side view so that you can see the distressed and sponged edges of my paper. I also embossed the background to give it a bit more texture. Those little trees are so adorable! The original image has a star on top of the tree but I cut it off so that it was more of a forest tree than a Christmas tree. "Not all who wander are lost." This is so true and I really love this quote from J.R.R. Tolkien. I had fun mussing up the background behind the camper and I use Gorgeous Grunge for the first time in quite a while. If you haven't already seen this set check it out! There are so many fun little images that you can use to decorate the camper and create background scenes. Do you have this stamp set? 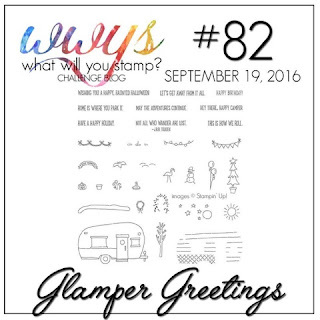 If you do then please play along with us over at the What Will You Stamp challenge blog. Just add your own creation to our page and you could earn the chance to be one of our guest designers! Alright that's all for today. If you are interested in purchasing any of the products that I have shared here today please click the link below to head my store. If you have any questions I would love to help you out so please leave a comment or shoot me an email at mariawillis@hotmail.com I'm looking forward to hearing from you! Need more stamps now? Never fear! I've got you covered! Want a great discount on Stampin' Up! Products and to have a fun new stamping family? Join me on this fun adventure! I can't wait to be your super excited (possibly way too enthusiastic... No! That's not possible!) Stampin' Up! side kick and support lady! In case you didn't know, you can join Stampin' Up! just for the discount and never sell a single product. If you want to know the details just let me know. If you're looking for a discount on your favorite hobby (stamping and paper crafting with Stampin' Up! products) and want to earn money doing it... let me know! I'd love to talk with you whatever your interest might be! If you want to see a little more info go ahead and click the button below. Looking forward to hearing from you! Beautiful Maria, I love all the little details you've added. Love the bright colors you used and the embossed stars. Another terrific card Maria! Happy World Card Making Day!! Fiesta Like There's No Mañana!! OSAT Blog Hop: Birthdays Bash! Sending a Smile Your Way-Country Style!